Triumph is all set to launch its modern classic motorcycle, the Speed Twin, in India on April 24. The roadster bike comes with a retro look and a bunch of classic features including a parallel-twin motor. which was launched in 2015. Triumph Speed Twin comes with a sports-naked, cafe-racer body and offers three riding modes- Rain, Road, and Sports. It features a USB charging socket and a twin-pod instrument console with each pod having a digital readout. However, other design features remain pretty much the same as the Street Twin, with LED daytime running lamp, LED rear lamp and LED indicators. The Triumph Speed Twin is powered by a 1200cc parallel-twin SOHC engine which churns out 96bhp of maximum power at 6,750rpm and 112Nm of peak torque at 4,950rpm. The motor comes mated to a 6-speed manual transmission and offers a maximum speed of 180kmph. Further, the engine gets a low-inertia crank, high compression head, and a revised torque-assisted clutch assembly. 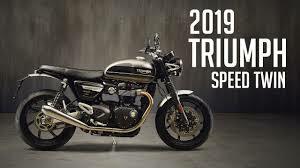 For braking performance, the Triumph Speed Twin offers disc brakes on both wheels, a dual channel ABS (Anti-lock Braking System) as well as switchable traction control. Further, it offers cartridge forks in the front along with a preloaded adjustable twin shock suspension on the rear side. Though Triumph Motorcycles has not revealed the price of Speed Twin, it is expected to be launched at around Rs. 11 lakh in India. The company's dealerships across the country have already started accepting bookings and the deliveries are slated to begin from April end.